“Do I need to shift? How fast will we go? Am I going to fall off?” Those were a few of the many questions that filled my mind in anticipation of riding ATVs at Snowbird Ski and Summer Resort. Fortunately, the ATVs are automatic. One question down. But several more answers to go. Looking back it seemed silly to be intimidated to ride an ATV. But now that I’ve done it, I realize it was only the fear of the unknown that was holding me back. Not the ATV ride itself. How fast you go is completely determined by your ability and comfort zone. And the staff of Snowbird is fantastic at accommodating everyone’s interests and capabilities on these trips from beginner to advanced. Here’s how it works: After buying your ticket and making all necessary arrangements through the Activity Center, you climb aboard the Tram with your ATV guide. Within a few minutes, the tram has whisked you over miles of pine trees, wildflowers, cliffs and the occasional moose or deer. Once you get off the tram and step out onto the summit of Hidden Peak (elevation 11,000’) you can see for miles and miles in every direction. Remember -- even if it’s really hot in the valley, it’s surprisingly cool that high up. So be sure to bring a jacket. Next, it’s helmet fitting time and a brief overview of how to drive the ATVs. Then, you’re off! You’ll climb up and down steep rocky slopes, straddle huge rocks, and really feel the power of the machine below you. They’re loud. They smell like exhaust. And it’s fantastic. 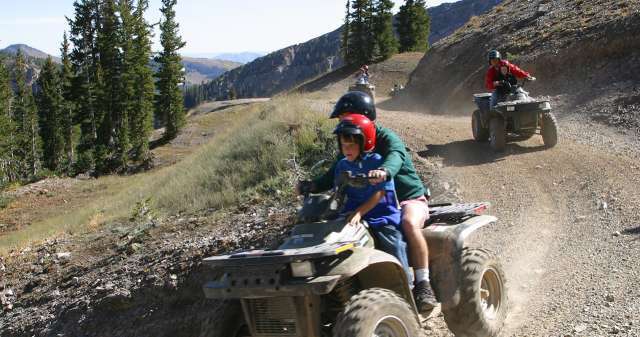 Add the breathtaking scenery of Mineral Basin and American Fork Canyon to the experience and you’re guaranteed to have one of the best afternoons of your entire summer. Don’t forget to bring a camera, since you will see some truly spectacular views of not only Mineral Basin, but of Heber, American Fork Canyon and the Salt Lake Valley. One and two hour trips are available, but if you have the time and means – go with the two hour. You won’t regret it!